Resilient (adjective): Able to withstand or recover from difficult situations. 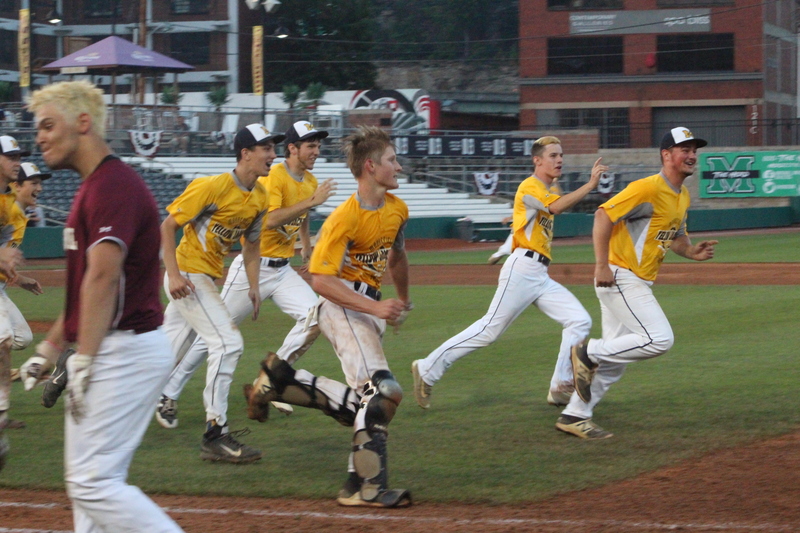 The fourth ranked Yellow Jackets are the epitome of the word resilient, fighting through adversity in an eight inning battle with second ranked Wheeling Central Catholic to become the West Virginia Class A State Baseball champions with a 4-3 victory at Appalachian Power Park in Charleston on Saturday night. “I can’t think of another word [resilient] that best describes this game and the situation,” Moorefield skipper Wade Armentrout remarked. Moorefield (23-9) has been full of confidence and poise the entire season and it was that same confidence that boosted the team from the start of the state championship with aggressive hitting for an initial 3-0 lead and the faith and encouragement from skipper Wade Armentrout instilled in freshman Isaac Van Meter being handed the ball to lead the Yellow Jackets on the mound as the starting pitcher performing through five innings. “Isaac’s [Van Meter] demeanor, he’s done that so many times before. It’s not surprising to us that he did that. It’s absolutely a trait that he has that keeps everybody around him from panicking, knowing that no matter what happens we have a chance. Coming up late in the game making the hit that scored the run, it’s a complete team victory. Throughout the playoffs, we only gave up one earned run. Our pitching has been great and our defense has improved as the year went along and we needed that to happen. We’ve beaten two really good baseball teams over the past two days,” Coach Armentrout stated. This was the third state baseball championship under coach Armentrout in six appearances in Charleston during his 19th season at the helm for a career record of 352-176 with the two previous titles coming in 2002 and 2009. 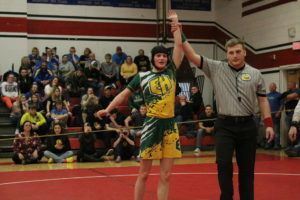 One of the challenges faced was actually before the title match began as there was a rain delay in the Class AA state championship game forcing another late start for the Yellow Jackets, but the focus and determination was never washed away. 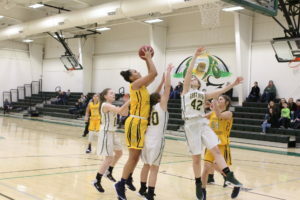 Another challenge was proving that having a young team starting two freshmen and three sophomores would in fact be beneficial in garnering the victory. 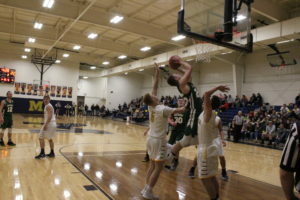 Moorefield soaked in the atmosphere and adjusted to the thrill of being in the title contest. Moorefield leadoff batter sophomore shortstop Brent Moran sparked the momentum with a single into center field off Wheeling Central Catholic pitcher George Cupp. Moorefield junior designated hitter Grant Keller reached base on an error by Maroon Knights second baseman Patrick Brown taking a knee to stop the ball and it skipped past his glove. A sharp grounder by Yellow Jackets junior Blake Watts was bobbled by Wheeling Central Catholic shortstop Bryan Courts, who launched an off-balanced throw past the leap of Brown providing enough time for Moran to score on the play, 1-0 nil. Two giant cardboard faces of Moorefield coach Wade Armentrout and assistant coach Scott Stutler were raised up as the Yellow Jackets fan base applauded. After a fielder’s choice out at second base off the bat of senior center fielder Jake Ours, Moorefield added to the lead on freshman third baseman Hayden Baldwin’s RBI single into center field with Ours making it to third base. Van Meter notched an RBI sacrifice fly in right field with Jake Ours tagging up for the run home putting the Yellow Jackets ahead 3-0 before a pop-up by sophomore brother catcher Lane Ours was caught by Brown. Wheeling Central Catholic’s Doug Clark grounded out back to Van Meter on the mound, then Cupp and Brown garnered singles into left field. Logan Wells singled into left center field to load the bases for the Maroon Knights (24-5), then Adam Murray struck out. Wheeling Central Catholic’s Chris Furka cleared the bases on an error tying the game as the ball went off the glove of Moorefield’s Jake Ours rolling toward the warning track giving Furka time to slide into third base and a pop-out by Angelo Gentile to first baseman Blake Watts ended the inning. Remarkably after such a start, there were no more runs to be scored from the second through the seventh innings.